Genetic Engineering Department, Biotechnology Center, Doha, Qatar. Received July 17th, 2011; revised August 16th, 2011; accepted September 5th, 2011.
from seven RAPD primers with an average polymorphism of more than ninety nine percent across all the genotypes. using ISSR and RAPD analysis. optimal exploitation of these natural resources [2,7]. versity in this genus have involved isozyme analysis. variation analysis in tree species like P. cineraria. determination of the relative heterogeneity of the species. to the gel using the 1.5% agarose at 30 Volts for 180 min. phImager EC by Alpha View software V.3.0.0.0. of polymorphism) for a marker locus used in linkage. Hamming similarity index with 100 bootstraps. 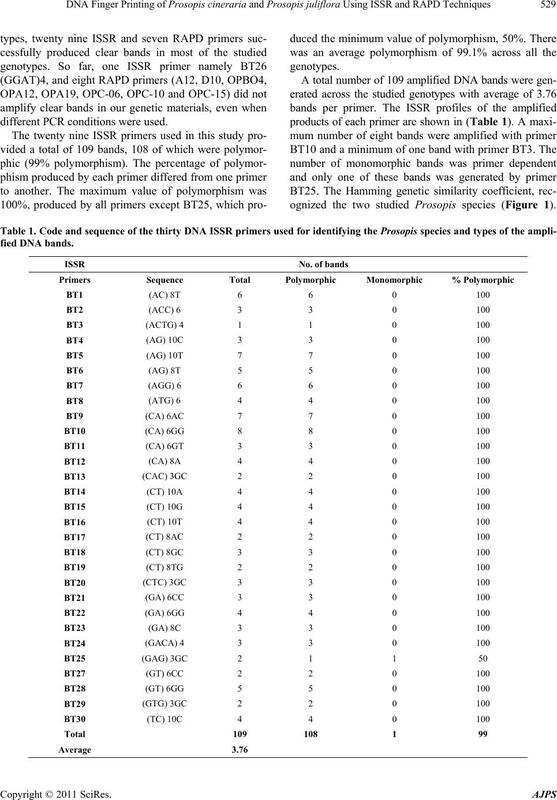 different PCR conditions were used. 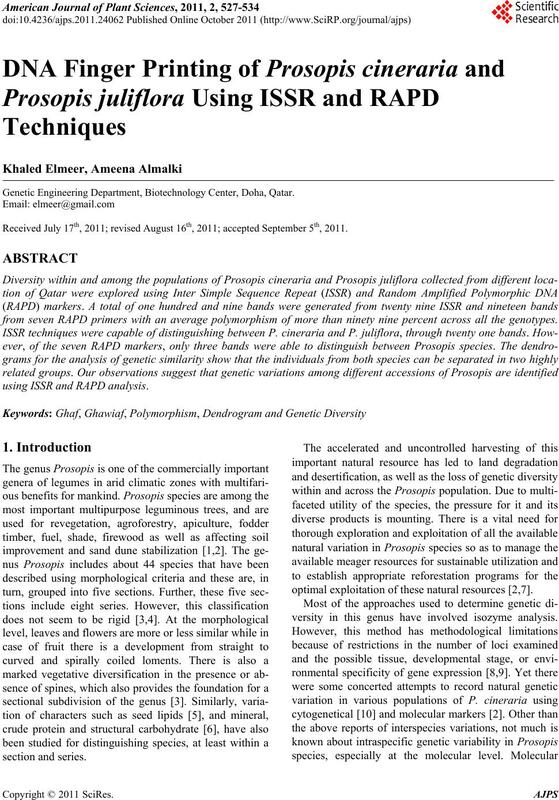 ognized the two studied Prosopis species (Figure 1). Figure 1. 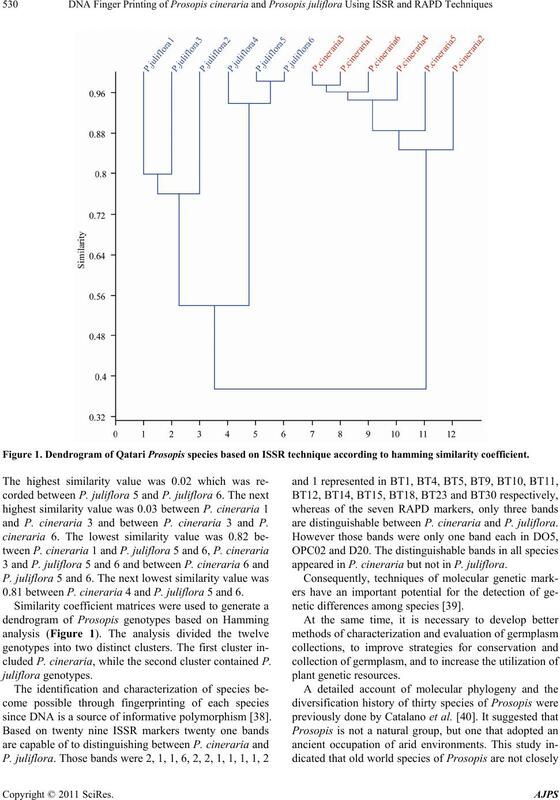 Dendrogram of Qatari Prosopis species based on ISSR technique according to hamming similarity coefficient. and P. cineraria 3 and between P. cineraria 3 and P.
0.81 between P. cineraria 4 and P. juliflora 5 and 6.
cluded P. cineraria, while the second cluster contained P.
since DNA is a source of informative polymorphism . are distinguishable between P. cineraria and P. juliflora. appe ared in P. cineraria but not in P. juliflora. netic differences among species . only. This is in support of observations by Sharma et al. lected from different districts of Rajasthan. America, and Rheum  in East Asia. the time to coalescence . value was 0.0, which is identically recorded between (P.
which was the same result with ISSR markers and (P.
6), the next lowest similarity value was 0.89 between (P.
cineraria 3 and P. juliflora 4, 5 and 6) . cludes P. cineraria, while the second cluster contains P.
*Band distinguish bet w e en species. Figure 2. 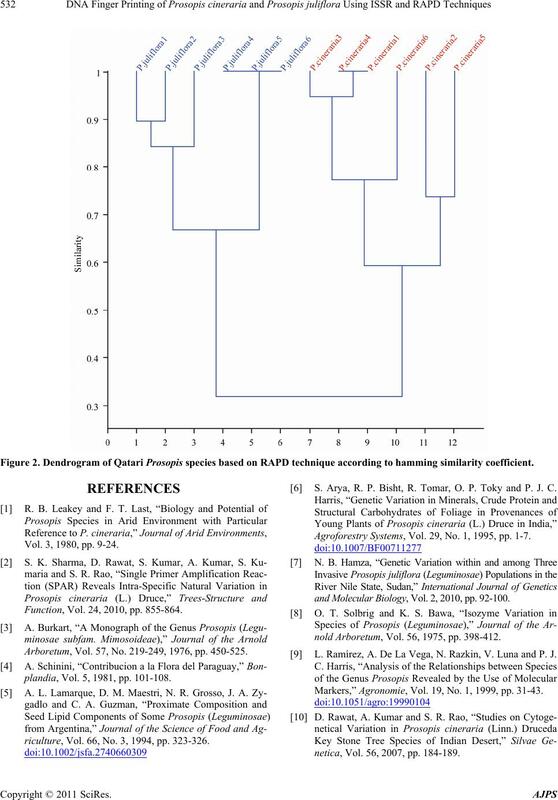 Dendrogram of Qatari Prosopis species based on RAPD technique according to hamming similarity coefficient. Vol. 3, 1980, pp. 9-24. Function, Vol. 24, 2010, pp. 855-864. Arboretum, Vol. 57, No. 219-249, 1976, pp. 450-525.
plandia, Vol. 5, 1981, pp. 101-108.
riculture, Vol. 66, No. 3, 1994, pp. 323-326. S. Arya, R. P. Bisht, R. Tomar, O. P. Toky and P. J. C.
Agroforestry Systems, Vol. 29, No. 1, 1995, pp. 1-7.
and Molecular Biology , Vol. 2, 2010, pp. 92-100.
nold Arboretum, Vol. 56, 1975, pp. 398-412. L. Ramírez, A. De La Vega, N. Razkin, V. Luna and P. J.
Markers,” Agronomie, Vol. 19, No. 1, 1999, pp. 31-43.
netica, Vol. 56, 2007, pp. 184-189. No. 21, 1982, pp. 6465-6469. Cotton,” Molecular Ecology Notes, Vol. 3, 2001, pp. Vol. 129, No. 1, 2003, pp. 69-79. Euphytica, Vol. 132, No. 3, 2003, pp. 297-301.
vance to Breeding Programs,” Euphytica,. Vol. 131, No. Nucleic Acids Research, Vol. 18, No. 22, 1990, pp. by RAPDs,” Euphytica, Vol. 103, No. 2, 1998, pp. J. Juárez, G. Carrillo-Castañeda, R. Arreguín and A.
Biodiversity and Conservation, Vol. 11, No. 5, 2002, pp. C. Degani, L. J. Rowland, A. Levi, J. A. Horty nski and G.
 D. Kaemmer, R. Afza, K. Weising, G. Kahl and F. J. Nature Biotechnology, Vol. 10, 1992, pp. 1030-1035.
and Biotechnology, Vol. 11, No. 4, 1995, pp. 438-448. 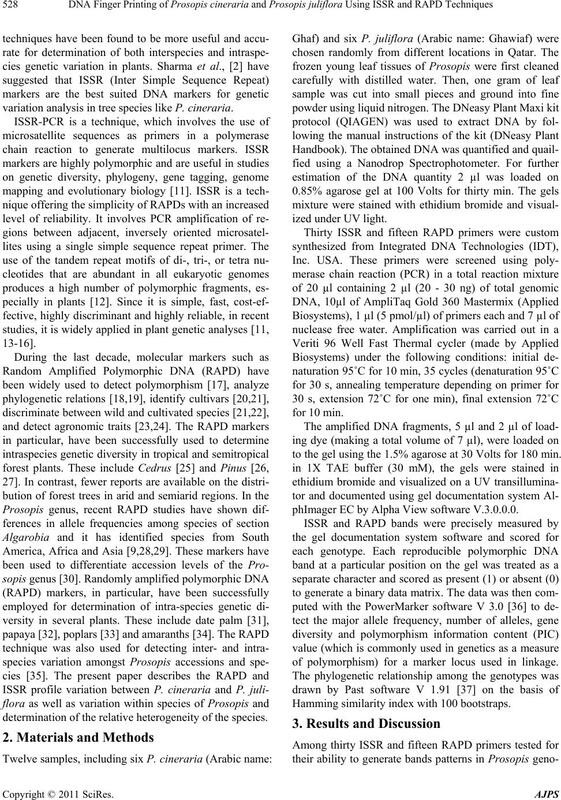 Polymorphic DNA,” American Journal of Botany, Vol. netica, Vol. 53, No. 4, 2004, pp. 169-175. Biochemical Genetics, Vol. 43, No. 5-6, 2005, pp. B. O. Saidman, C. Bessega, L. I. Ferreyra and J. C.
Bonplandia, Vol. 5, 1998, pp. 101-108. Plant Science, Vol. 101, No. 2, 1994, pp. 163-172. J. I. Stiles, C. Lemme, S. Sondur, M. B. Morshidi and R.
Cultivars,” Theoretical and Applied Genetics, Vol. 85, No. 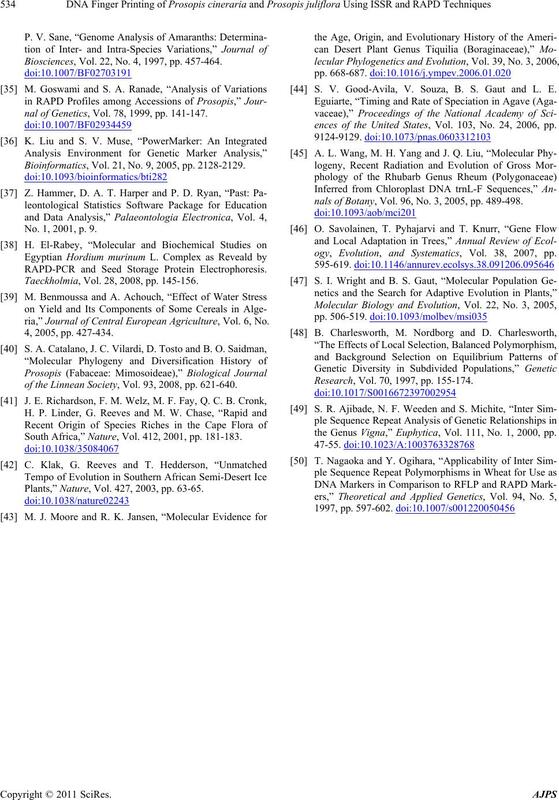 H. D. Bradshaw, M. Villar, B. D. Watson, K. G. Otto, S.
Biosciences, Vol. 22, No. 4, 1997, pp. 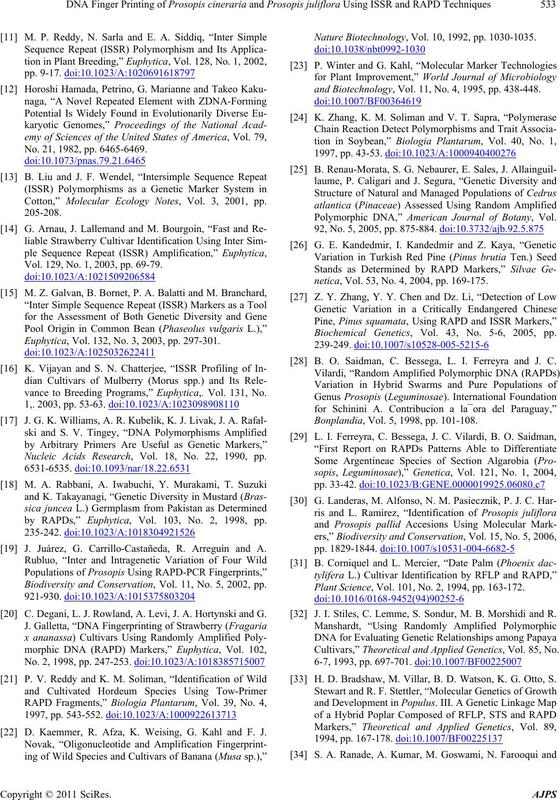 457-464.
nal of Genetics, Vol. 78, 1999, pp. 141-147. Bioinformatics, Vol. 21, No. 9, 2005, pp. 2128-2129. No. 1, 2001, p. 9. 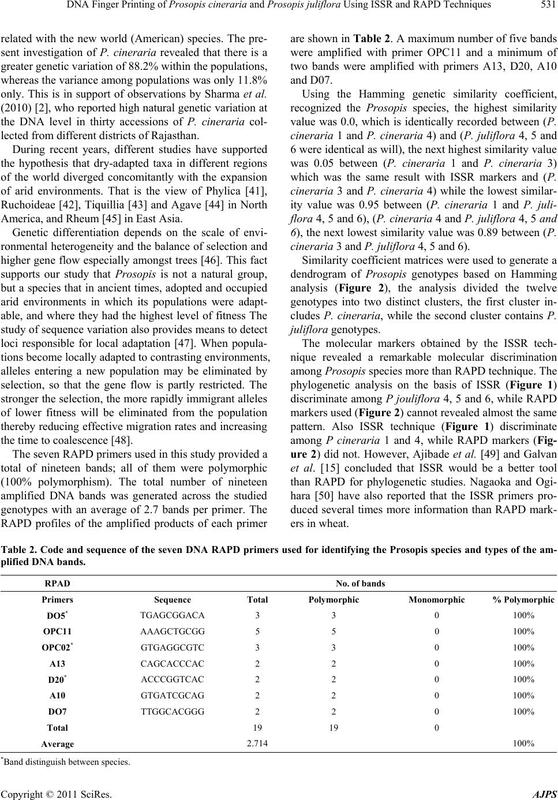 RAPD-PCR and Seed Storage Protein Electrophoresis. Taeckholmia, Vol. 28, 2008, pp. 145-156.
ria,” Journal of Central European Agriculture, Vol. 6, No. of the Linnean Society, Vol. 93, 2008, pp. 621-640. South Africa,” Nature, Vol. 412, 2001, pp. 181-183. Plants,” Nature, Vol. 427, 2003, pp. 63-65. S. V. Good-Avila, V. Souza, B. S. Gaut and L. E.
ences of the United States, Vol. 103, No. 24, 2006, pp. nals of Botany, Vol. 96, No. 3, 2005, pp. 489-498.
ogy, Evolution, and Systematics, Vol. 38, 2007, pp. Research, Vol. 70, 1997, pp. 155-174.
the Genus Vigna,” Euphytica, Vol. 111, No. 1, 2000, pp.